Mark Wahlberg, Dwayne Johnson, and Anthony Mackie are ready to bring the pain in Michael Bay’s Pain & Gain, the true story of a couple of weightlifting aficionados who turn to a life of crime to make ends meet. With the film a little over a month a way, Paramount has released a new red band trailer to remind everyone that Bay is capable of directing films that don’t involve massive explosions. 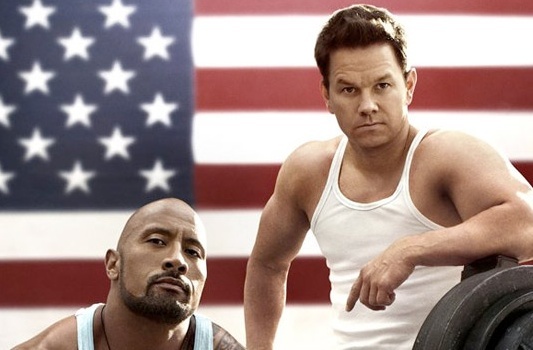 Check out the NSFW red band trailer for Pain & Gain below. Macklemore & Ryan Lewis’s “Thriftshop” is the perfect theme song for a film like this one. The three main characters are just tired of living on the lower end of the social ladder and rob one of Miami’s most notorious sleazes (Tony Shalhoub). There is more than just slam-bang action though, there seems to be plenty of comedic banter going around. And for the guys, there are bikini-clad women strutting their stuff as well. Of course Ken Jeong has to be the one to hook up with seven of them. Aside from that, I like that Bay took a momentary break from the Transformers gig to do his passion project. Pain & Gain also stars Rebel Wilson, it opens in theaters on April 26.